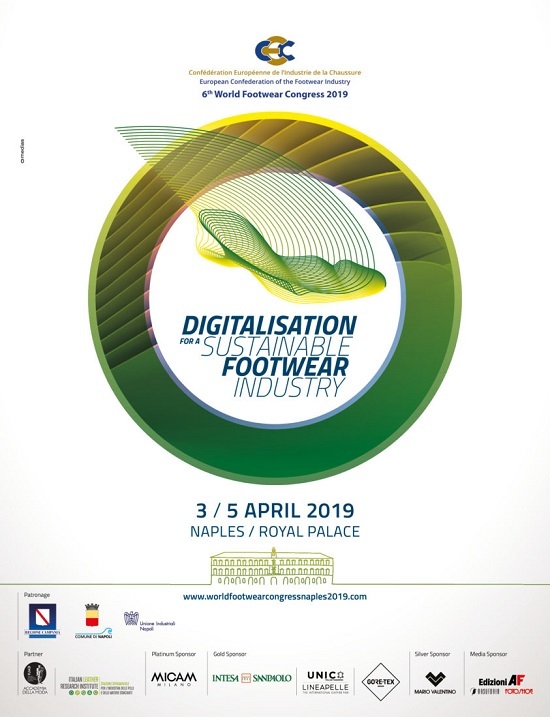 The sixth edition of the World Footwear Congress will be held in Naples on the 4th and 5th of April 2019. On the 3rd of April, visits to the Italian Leather Research Institute and to the Kiton and Mario Valentino factories are scheduled, besides a Welcome Cocktail by the end of the day. The World Footwear Congress will address sustainability and digitalisation as revolutionary drivers of the footwear industry under the title Digitalisation for a sustainable footwear industry. The main objective of the forum will be to discuss different perspectives of what this represents for the consumer, the manufacturer and the retailer. The congress will bring together high-level international speakers and experts to discuss digitalisation and sustainability and their significance for the future of the footwear sector. The themes of the 6th edition of the World Footwear Congress were recently made known and will include various presentations and roundtables with key speakers from the international footwear industry. - New Marketing for New Consumers: Influencer, testimonial or KOL? How is social media marketing changing the conversation between brands and consumers? - Round Table on how companies adopt their strategies to consumer tastes and aspirations. - Online custom-made shoes are the future? How can low-cost technology change the factory of the shoe manufacturers? - New Retailers for New Markets: How big marketplaces are changing the commercial strategy of shoe brands all over the world? For more information and to access the full programme of the event please refer to the website of the 6th World Footwear Congress. The CEC, the European Confederation of the Footwear Industry, created the World Footwear Congress as a platform to discuss the rapid changes, challenges and opportunities that this dynamic industry has been facing since the beginning of the globalization. The World Footwear Congress serves in particular for the promotion of a free and fair global market with equal chances for all on a reciprocal basis, while increasing international collaboration. The event is opened to all categories of worldwide footwear stakeholders (manufacturers and retailers, sector associations, technological and educational centers, policy makers, journalists, etc). The last edition of the forum took place in 2014 in Léon (Mexico).